Delicious Obsessions is one of my favorite blogs! Anything you want to know about gluten free Real Food and Healthy Living can be found here, including recipes, DIY advice and hundreds of articles and guest posts from Jessica and many health and food experts. 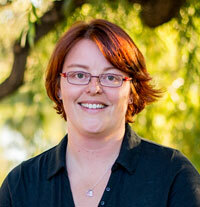 Jessica’s passion is developing recipes for foods and self-care products. They’re gluten free, Paleo friendly, easy and creative. Jessica’s a big fan of coconut oil, and in our interview (see link below) she shared one of her favorite recipes – for Whipped Honey Cinnamon CocoGhee. Use it as a spread on food or eat it by the spoonful to get more healthy fat. Yum! Another favorite Jessica shares with us is Cinnamon Vanilla Herbal “Coffee”. It’s her favorite coffee replacement, full of hearty tonic herbs, coconut oil and gelatin. An easy way to get healing foods into your day. Check it out here. We talk a bit in this podcast about gelatin newcomer Vital Proteins. Here’s a link to my article about Vital Proteins, and why I prefer it to Great Lakes brand. Gelatin is important if you don’t use bone broth – its high concentration of Glycine and Proline are great healers of the body’s joints, skin and gut mucosa. Spending time on Delicious Obsessions website is like having a mountain of favorite books and magazines at your feet. Jessica has a knack for coordinating great recipes and health info with a beautiful website and active Facebook and Google Plus communities. Her contributing authors share hundreds of recipes and health tips in organized posts you can find quickly. Check out her newsletter, and multiple eBooks on Grain Free beverages, snacks and healthy real food. 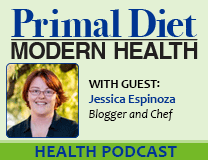 In our Primal Diet – Modern Health interview, Jessica talks about her weight, thyroid and adrenal problems, and her efforts to heal her gut and Hashimoto’s with real food. Coconut oil was her weight loss miracle so you’ll get some inspiration on that in this interview. Jessica shares about helping out in the kitchen as a child. Lucky girl to find a passion so young! And she’s got some advice for us about hungry dogs hanging out in the kitchen…. Now where did that chicken go?? Do you have an egg intolerance? If so, there’s several tutorials and recipes on creating baked goods without eggs. We talked a bit about eggs and my feeling (both personally and as a clinician) that egg intolerances can lead to gall bladder problems of various kinds. My own sneaky egg intolerance was literally a pain in the neck and upper shoulder (on the gall bladder acupuncture meridian) that went away when I did an egg-free challenge. Jessica shared her own findings about eggs and her gall bladder too! Want to make your own chemical-free toothpaste, body scrubs, facial cleanser, deodorant, shampoo and hand sanitizer? You’ll find them on her website here. There’s a staggering amount of information here, but it’s so well-organized that you never want to leave the site. Cooking is do-it-yourself too, so remember there are hundreds of excellent recipes here, many of them from favorite authors and bloggers. Here’s one to look for: try this Creamy Coconut Green Chile Soup if you’re in the mood for a hearty winter soup. Excellent! I hope you enjoy getting to know Jessica as much as I did. I have a huge appreciation for people working to heal their bodies and minds, and who share their guidance with the rest of us. Thanks Jessica!